Featuring a mid-depth bowl and spruce top, the Celebrity Standard Left-Handed Acoustic-Electric Guitar produces rich, full sound. Single cutaway gives you easy access to the upper frets. A piezo pickup and OP11 preamp with 3-band EQ deliver lush, plugged-in sound. The rosewood fretboard is adorned with dot and diamond inlays. Walnut bridge, chrome tuners, and Ovation Oakleaf rosette complete the package. Now you can have that signature Ovation sound without it costing an arm and a leg! Call or click to order yours today! I wanted to share my thoughts on the Ovation Celebrity LCC 047 left handed acoustic electric guitar.Let's talk about the good things first:1) The honeyburst finish was flawless and beautiful. 2) Overall, a very attractive guitar.3) The Ovation Celebrity, when played without amplification, puts out plenty of sound. It rivals my dreadnaughts.4) When played with amplification, it is amazing. Ovation has done a wonderful job with the electronics. You get a full bodied, acoustic sound. Compared to cheaper electronics, you don't get any feedback problems or tinny sound.5) The equalizer works very well to tailor the sound. Did I mention I liked the electronics? !6) The bridge is set up so it doesn't need bridge pins. Instead, string holes are provided from the back of the bridge. This makes string changes really easy. I like this feature, but cannot say whether it might lead to future bridge pull up due to the string tension across the bridge. On that I'll just have to wait and see.7) I like the look of the diamond shaped inlays and the soundhole ring. They are nice touches.8) The tuners are solid and once the new strings set in, it holds tuning well. I would call the tuners "closed, Grover type".9) The guitar has a front strap button. That's very handy. Most other acoustics seem to only have the back button.10) The cutaway in the body is nice for easily getting those higher notes.Now here are a few neutral points:1) There is no pickguard. Of course that is obvious when you look at the guitar, but once you start playing you might want to tone down your strumming a bit to save that beautiful finish.2) Ovation acoustics have a round, not flat, back. When you are standing to play, there is a tendency for the guitar face to tilt upward. That can force your fretting hand into an awkward position. I am hoping with a more practice I can learn how to keep the guitar aligned better.Similarly, when you are playing while seated the guitar every so often wants to slip. I'd suggest wearing your strap even while seated to avert an unexpected drop.Now the negatives:1) The guitar came with a few minor flaws. First, the nut was slightly off-center. Not by much, but I noticed it quickly. Second, there was a small rough patch in the finish on the back of the neck. It is very evident to the touch. Neither of these items is significant, but they do show a little bit of laxity in the final inspection process.2) The setup on the guitar as it was delivered to me was terrible. The action was too high to be very playable. The neck had a significant bow in it. If you are comfortable making neck truss adjustments or are willing to pay to have the guitar properly set up by a pro, this isn't that big an issue. Otherwise, hope you get one better setup at the factory than I got. Who knows, maybe mine was just a fluke.Summary: Once I got the setup issues resolved, the Ovation Celebrity is a great acoustic/electric guitar. There is a lot to like about this instrument. .I bought this for my now 15 year old daughter Melissa a few years ago and may I say it has been one of the best investments I ever made for her. The guitar is stunning and seems to be made with great care and quality. I guess that is why this guitar is still selling today. I can't believe I still saw this for sale so I had to write a review. First the guitar was not set up properly when we received it and we took it to a pro here in Brooklyn, NY to set it up. Sounds so much better. In the past few months we also went to lighter Martin strings and now it even sounds more superb. 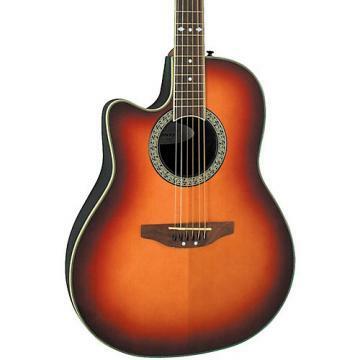 The LCC 047 left handed Celebrity Ovation guitar is so beautifulin its honeyburst finish and so rich in sound with an amp and even without one. She gets compliments where ever she plays. Sounds great even in a large auditorium with lots of people when she performs for her school. The only drawback is the round bowl in back of the guitar which is kind of hard to perform standing up. She'd rather play it sitting down. Overall I would recommend this to any lefty out there for a great piece of workmanship, sound and for the price. It's music to my ears! .Professionals I know we're on board for me to get this in left handed for my daughter. Some reviews say set up was bad but I handed it to a friend to check out. Put on lighter strings just because of my daughters style not because of the way it came. Great set up. Shipped IN the case and well packed. How cool is that in this excess packaging world we live in? .I purchased this guitar summer of 2005. This was my first acoustic guitar. As a lefty it is difficult finding quality instruments to play, but this fit the bill perfectly. 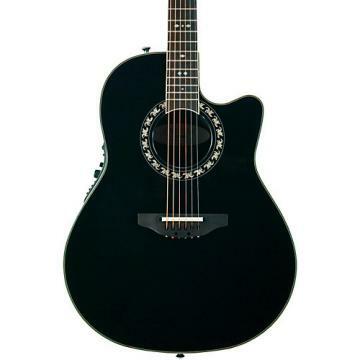 I first tried this guitar, along with other acoustics, and just like another reviewer posted - I couldnt put it down. For anyone looking to get serious about playing the guitar, this is a great instrument to start with. Doesn't cost as much as the higher end guitars, and is way better than the cheap starter guitars. If you are a beginner like me you probably wont even be able to tell the difference in sound between this and other higher end models. The finish is beautiful, the sound is clear, and the neck feels smooth as silk. More importantly, I have owned this guitar for more than two years now and I still love the sound it produces. And isn't that what guitar playing is all about? I look forward to playing this guitar for years to come. .I'm not really sure what it is with half of us lefties playing this with a Christian tag, but I want to get this for use at my church. I found one in a local guitar store and have stopped in many time to play it, it is very worth the price listed here, but it seems like you can find these much cheaper at individual retailers, the one ive seen is only 250 dollars and it still works and plays fine. great guitar. .I purchased this Ovation LCC 047 Acoustic / Electric guitar along with the Ovation 8158 hardshell case from the original owner, who bought the combo new in 2005. It came strung with the original D'Addario strings which were as dead as a door nail. I promptly replaced these with a set of Martin Acoustic SP Light's (.012 ~ .054). After a day of allowing the strings to set in, I was amazed at how well this guitar stayed in tune. Only then, did I realise what a beautiful sounding guitar Ovation made. The tone is almost piano like. Chords played are clear and precise, although unplugged it lacks the volume of an all wood acoustic guitar. Plugged in, it's incredible. If I had to say anything bad about this Ovation, it would be that it tends to slip off your lap when played sitting on a stool. However, a good guitar strap will cure that. The hard Honeyburst finish on the spruce top was flawless. The bottom line: A well made guitar well worth the money. Everything appears to be built well, It is built in Japan. When I received it both ovation and musicians friend had packed it well. I have only had it a few days but so far everything appears to be built well. I think that it sounds as good as more expensive guitars and has a good volume unplugged. I have not had it plugged in yet so I can't say on that. .I got this guitar a few days ago and I love it. The tone is great, it plays great and the action is as low as the action on my Stratocaster, and it also stays in tune really well. I've been looking for a guitar like this for a long time, and since I'm left-handed it's been hard to find one, but this is it. If you're left-handed and can't afford a really expensive acoustic guitar you will not be disappointed by this one. .I just got this guitar! 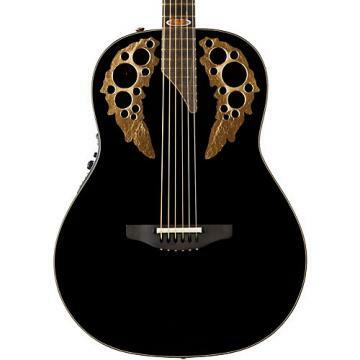 I always wanted an Ovation. I'm a lefty and it is very hard to find left handed guitars, without paying through the nose.This guitar is very cool! .I played this at my local GC, and I couldnt put it down. It sounds so beautiful, looks beautiful, and it plays awesome. It has very nice action, a very full and loud sound, and a warm tone. It is well worth the price. I think it sounds a lot better than quite a few upscale guitars I have played. I would reccomend it to any lefty player who is looking for a great guitar. Not only does it sound and look beautiful, but playing it is very comfortable due to the round back. Buy it.